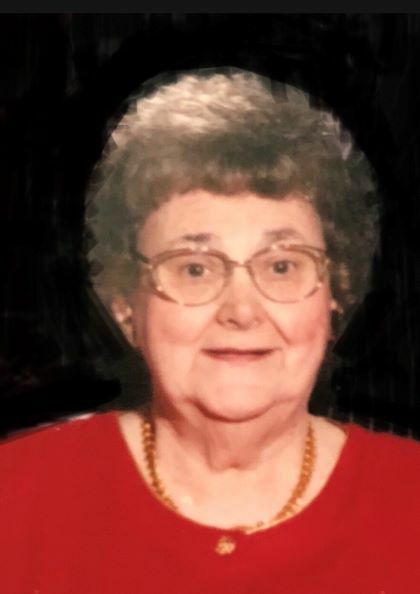 HURON - M. Christine Hahn, 92, of Huron, passed away after a brief illness on Sunday, April 7, 2019. She was born September 15, 1926, in Zanesville, Ohio to John and Beatrice Alter. She was a 1944 graduate of Lash High School, Zanesville and graduated from Muskingum University, in 1948. She moved to Huron, Ohio in 1948 and began her teaching career as an English teacher at Huron High School. She enjoyed directing many plays during her teaching career. After she retired from teaching, she worked in the credit department at Sears for many years. She married Ted Hahn on April 17, 1954. He preceded her in death in 1999. She is survived by three sons; Leslie (Lisa) Hahn of Cleveland, Gordon (Mary Ann) Hahn of Huron and Roger Hahn of Huron; grandchildren, Adam, Lucas (Lisa), Eric (Heidi), Victoria, Anne Marie, Amanda and Laura (Joshua) Evers; a brother, John (Elizabeth) Alter of Malone, Florida; and many nieces and nephews. Christine was the matriarch of Hahn Farms, Huron. For nearly 50 years she sold sweet corn, strawberries, eggs, asparagus and other produce. She greeted customers with her warm personality and friendly voice. She was a 65 year member of Zion Lutheran Church, Huron. She was an avid reader and was a member of the Huron Book Club and Huron Study Club. She was also a member of the Eastern Star. She never used technology to stay connected to the hundreds of people she knew. She enjoyed sending and receiving greeting cards and letters from her friends and family. People always commented on her impeccable handwriting! Friends may call Wednesday, April 10th from 5:00 p.m. until 8:00 p.m. at Foster Funeral Home, 410 Main Street, Huron, and from 9:30 a.m. until the time of funeral service 10:30 a.m. April 11th, at Zion Lutheran Church, 930 S. Main Street, Huron, with Rev. Kristine Schroeder, officiating. Burial will follow at Scott Cemetery, Huron. Those wishing to contribute in Christine’s memory may do so to: Zion Lutheran Church, 930 S. Main Street, Huron, Ohio 44839; Huron Fire and Rescue, 413 Main Street, Huron, OH 44839, or Stein Hospice Service, 1200 Sycamore Line, Sandusky OH 44870.